One weekend over the winter Neni and her husband Stathis came to visit us at our cottage on Long Island. 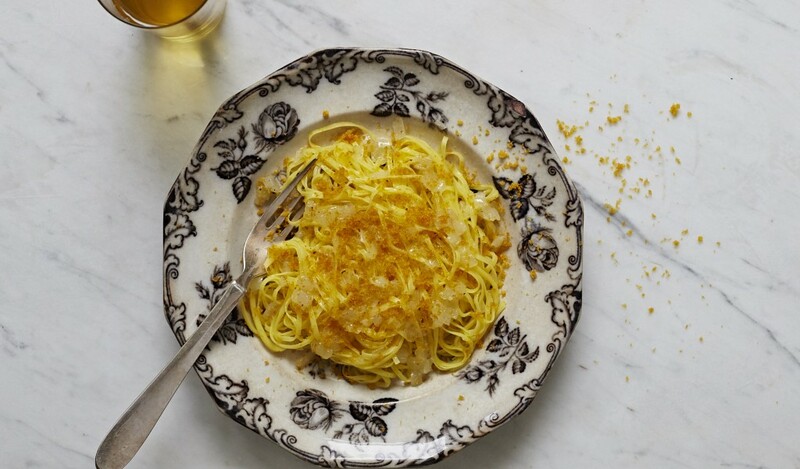 She brought a jar of tuna bottarga (dried and pulverized grey mullet roe), a pound of spaghettini, a bottle of good olive oil (from her family orchard near Athens), a couple of lemons and a couple of onions. She minced the onions and cooked them in a good deal of oil very low and slow until the onions were utterly soft and translucent. Then she boiled thin cut spaghetti and tossed it in the oil and onion mixture with lemon juice, salt and pepper. She sprinkled bottarga on the top and that was it. The dish was so elegant and simple and satisfying that I went on to make it many times. And not only with bottarga, which I love (it works with tuna roe as well), I’ve also added tuna or mushrooms. I toss in a jar of my home canned tuna (tuna packed in oil will do, too), or sauté mushrooms in oil or butter until they have given up their water and the water evaporates and toss them with the pasta and onions, sometimes with a garnish of chopped parsley. Bottarga, by the way, is available in many Italian specialty stores. The truth is, this oil, onion, lemon juice combination makes an excellent base for a variety of garnishes. Since trying it, I’ve abandoned other “povera” type sauces that I’ve used as bases for garnishes: Oil and garlic? Not this year. And the leftovers make an awesome friend pasta. Oil a nonstick skillet and heat over a medium heat. Spread about 2 cups of the leftover pasta over the bottom of the skillet, turn the heat to medium low and leave it until the bottom is crusty golden brown. Flip the pasta over: I usually slip the pasta onto a plate, then flip it into the skillet to brown the other side. I like to serve it in wedges with a bit of hot sauce and a green salad. Neni used dried grey mullet roe bottarga (pictured above), but you can also use whole lobes, which you can find in Italian import stores or online, Gustiamo sells both. 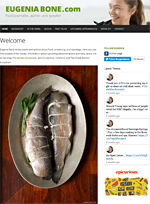 Whole grey mullet roe must be grated to serve. Be sure you pull off the wax casing if it is packaged in wax, and peel off the membrane around the roe before grating. Heat the olive oil in a large skillet over a low heat. Add the onions and cook them very low until they surrender, about 15 minutes. The onions must never brown and must be extremely soft. Bring the pasta to a boil and cook until al dente, drain and add to the onions, reserving a bit of the pasta water. Add the lemon juice, salt and pepper to taste and toss to combine the ingredients. If the pasta is not served immediately, add some of the drained pasta water to keep everything moist. 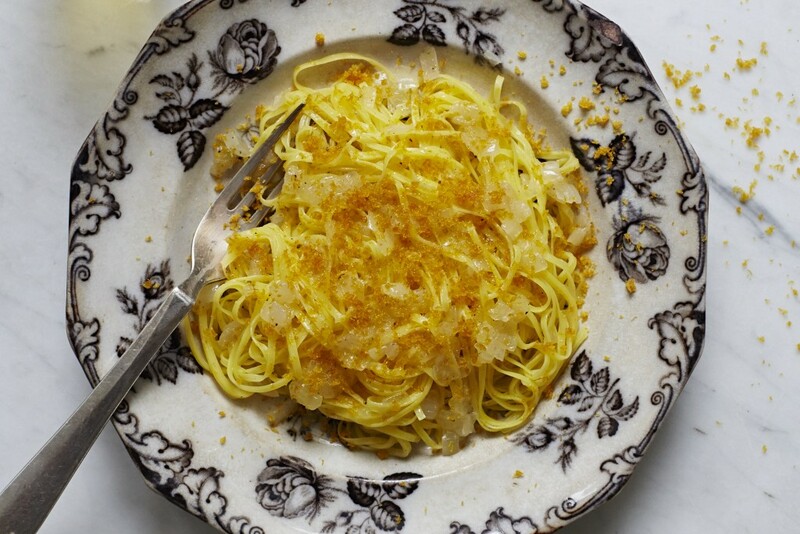 Plate the pasta and garnish with the bottarga. Note: The pasta type must be very thin. This recipe won’t work with spaghetti. Beautiful! 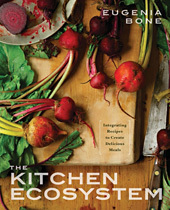 A perfect example of how a fabulous dish can be made from simple ingredients. I finally had bottarga when I was in Cornwall – on a seafood pasta. It’s a wonderful ingredient! Gena, dear, I don’t know how I could have made such a mistake but the bottarga that we make in Greece is from grey mullet, not from tuna…I am so sorry if I misled everyone that lovely evening and fed you something other than what it was…! I love bottarga so much that a friend of mine (a beloved and very generous friend) every time that I got here for dinner buys an entire bottarga lobe, peels off the wax, slices it very thin and lets me have the whole thing. And I do…shamelessly…! And this bottarga powder is a fairly new product in Greece, but so brilliant. No, my mistake darling. The label on the jar you brought was in Greek, and of course I couldn’t read it. I have dried Italian tuna roe in almost the exact same little cube shaped jar and so I made a silly assumption (though the tuna roe works well!) It’s corrected now.